Blackpool has long traditions, but has not been one of the countries top teams for many years. One of the best periods for the team was around the 1950s: FA Cup finals in 1948, 1951 and 1953 (with victory in 1953), and the clubs best result in the highest English division with a second place in 1956. Since 1967, it has been only two visits in the highest division (1970-71 and 2010-11). George Farm, Hugh Kelly, Tommy Garrett, Jackie Mudie, Stan Mortensen, Stanley Matthews, Harry Johnston and Charlie Adam. 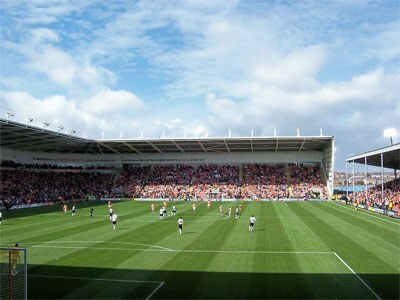 Bloomfield Road, the home of Blackpool FC. Founded in 1887 by former students of St John‘s School. Two years later, the other football club in town, South Shore FC, was merged into Blackpool. Some of the biggest profiles in the history of the club are Jackie Mudie, Stan Mortensen and Stanley Matthews.